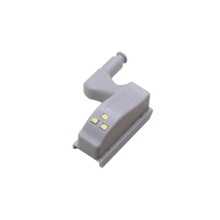 LED Sensor Light is as automatic as a motion sensor light, designed with automatically turn on / off function. With a press-contact switch, this cabinet lamp will be pressed down to cut off the battery power when the cabinet door is closed. No longer taking a flashlight when you find something in the cabinet! This LED cabinet light is practical and affordable, perfect for closet lighting, wardrobe lighting, kitchen cabinet lighting. Automatically turn on / off: when you open the cabinet, the bright white light will light up, no need to take a flashlight when you find something in the cabinet. When closing the cabinet, the light turns off. This hinge LED light can be used in the home, kitchen, office or hotel, perfect for cabinet, closet, cupboard or wardrobe with a hinge. No power cord, with wireless battery and 3 LEDs, brighter than an ordinary light bulb. Each hinge light is powered by 1 x 23A / 12V AAA battery ( not included ), more energy saving, no more expensive electric bills to pay for.